Today's post fulfills the other half of the promise by presenting the second method--the CROCHET HOOK METHOD (CHM). To be honest, of the two, the SYTK is the more versatile. SYTK can be used anywhere a left-leaning decrease is wanted--in a paired decrease situation, or for spiraling decrease. By contrast, the CHM is more limited--it works best on a spiraling garment where there are ONLY left leaning decreases, such as hats, or spiral-knit socks or mittens. This is because, while the CHM makes an insanely beautiful left-leaning decrease, it creates tension issues if you try to pair it with a right leaning decrease. Specifically, the CHM "overtightens" the fabric, creating a distinctive (and very beautiful) "welt." As beautiful as this welt is (see photo below) it is difficult (although not impossible--see the small print at the end of this post) to pair with a right leaning decrease such as k2tog. Continue as directed by the pattern, making ssk's where they ought to be, but remembering that, when you count your stitches, there will be ONE LESS STITCH than there ought to be, so do. not. panic. when counting! Step 2 (below) When all the decreases are done, you perform the next step. Begin by knitting around to the ladder above the stitch put on the holder. Take that first stitch off the holder. 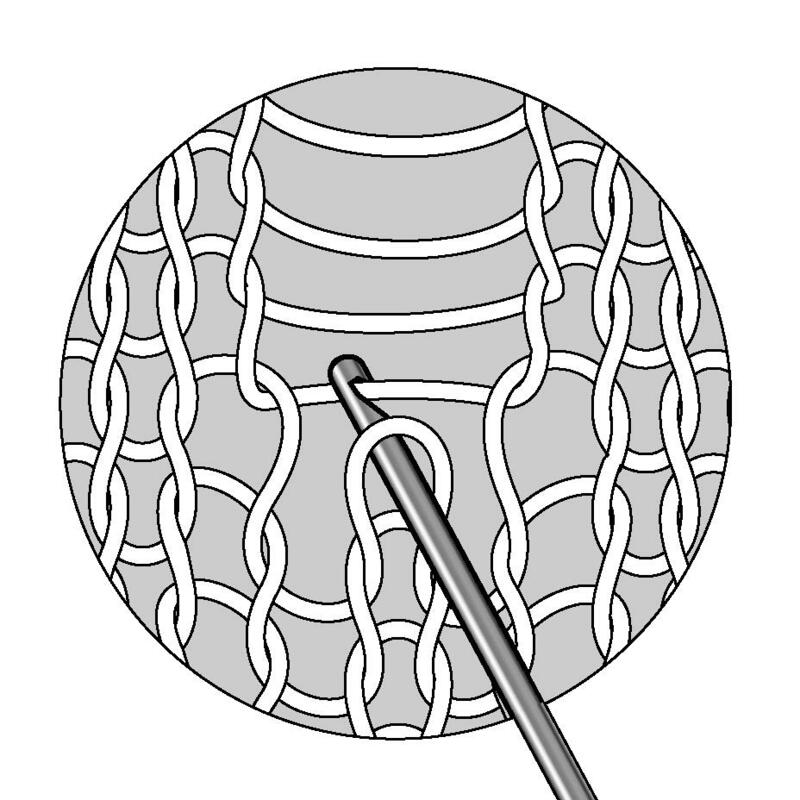 Next, thread a crochet hook through the front of the stitch, as shown. Then, hook up the first rung of the ladder to create a stitch. 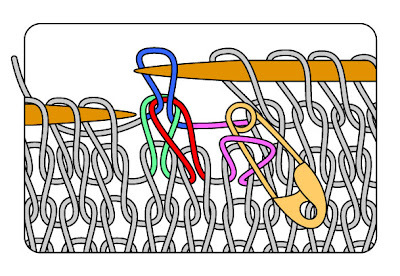 (This "hooking up" maneuver is the same move as if you had dropped a stitch, and were correcting with a crochet hook.) Continue hooking up the ladder rungs until you've gotten to the top of the decrease line. Pull the working yarn through at the top, place the newly created stitch on your right needle, and you will see that you again have the correct number of stitches which your pattern calls for. the decreases in the illustration are done every other row, but this method works regardless of how many "plain rows" lie between the decrease rows. although the temptation is nearly overwhelming to try the hooking step after only a couple of decreases, it'll look better if you save the hooking until the end. Hooking up all the ladder rungs at once gives a more even tension. If curiosity is killing you, go ahead and try it, but don't say I didn't warn you! Step 3 (below) The finished CHM fabric. Of course, the three drawn illustrations above make it all look clear and easy. But, when you come to do this trick, the ladder rungs won't be showing as they do in the illustration--they will be hidden next to the decrease. 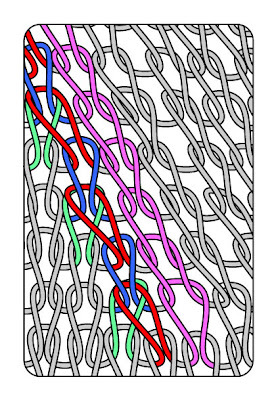 Also unlike the illustration, the small purple ladder rungs don't turn into regular sized stitches. The process of turning ladder rungs into stitches overtightens the neighboring stitches so much that the effect reaches well beyond the ladder, and that's how the "welt" illustrated in the opening photo was formed. 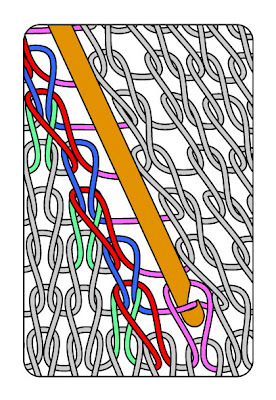 In other words, hooking up the little ladder rungs means that the new stitches formed from them are cramped and tight, the ssk's next door are yanked up tight, and so are the stitches two and even three columns in--it is this ridge of overtightened stitches which creates the welt. The drawn illustrations above also doesn't show how very loose the ssk's really are before they're tightened, so I've added a photo illustration below which does. These photos show a "before" and "after" shot of a hat knit purposely knit with very loose ssk's, which were then tightened by the CHM. As you can see, those are VERY loose ssk's, indeed. A note about fabrics: The gray fabric in the above illustration was knit loosely with a thickish yarn on large needles, (Plymouth Encore on size 5 needles). (Ok, yes, for me size 5's are large, because I knit loosely--3 sizes less than what standard pattern instructions call for.) The purple hat in the first photo illustration was knit tightly with thin yarn on small needles (Dale of Norway Baby Ull on size 0 needles). The CHM works for both kinds of knitting, although I will share with you that it was considerably easier to work the crochet hook through the the thicker, looser fabric of the second (gray) hat. I'll close this post with an analysis of using the crochet hook method in a paired decrease situation with right leaning decreases, for a raglan decrease, say, or a V-neck knit from the bottom up. The advantage of the CHM is that it makes a really, really lovely decrease, as nice as (or even nicer than) the SYTK. It is hard to overstate how lovely the welts look in person. But those lovely welts make it hard to match the CHM left leaning decreases with k2tog right leaning decreases. And, those welts in the CHM are nearly unavoidable: even when you think you are knitting your ssk's so loose that no welts will form, the CHM tightens the left leaning decreases beyond the tightest you could possibly knit the right leaning decreases, and there are those welts again! 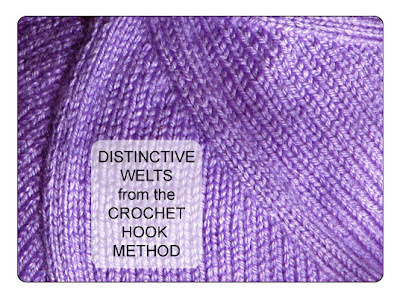 In other words, the welts are the beautiful side effect of cramming in a whole extra stitch row, but the welts also have the disadvantage of making it hard to match these left-leaning decreases with right leaning non-welt decreases. See for yourself: Both parts of the photo above were knit at the same gauge, on the same needles, of the same yarn (Brown Sheep Bulky). 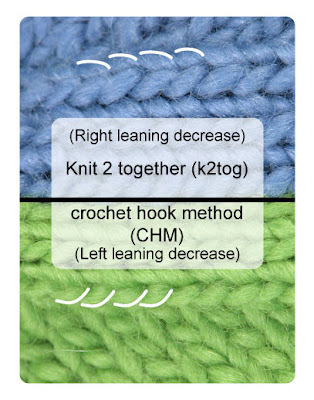 The line of decrease of CHM (green) is much tighter and smaller, and the stitches are much smaller than the k2tog line of decreases (blue) despite the fact that the ssk's in the CHM method were knit VERY loosely. HOWEVER ... however. If you are still determined to use CHM in a paired decrease situation, it IS theoretically possible to also tighten up k2tog by the CHM. 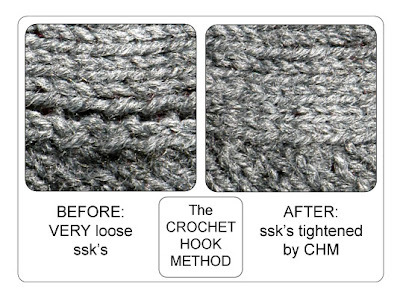 In other words, if you really want to use the CHM to make those distinctive welts in a paired decrease situation, you can knit the k2tog's AND the ssk's LOOSELY, then tighten up both the k2tog's AND the ssk's with the crochet hook method. This would create welts along BOTH lines of decrease, and would look very well on a garment in plain stockinette. If you tightened up both lines of decrease with the CHM, the lovely welts created would serve to reinforce the design element laid down by the garment decreases, both left leaning AND right leaning. Bottom line: the crochet hook method makes lovely left-leaning decreases along the edge of welt. It is best reserved for spiraling garments--those featuring only left leaning decreases without any corresponding right leaning increases, such as hats. However, (see the fine print above) you CAN use the CHM in a paired decrease situation if you're willing to mess around. Have fun with this! --TECHknitter.